North Carolina identify your AMI percentage before taking your first step with FEMA for IA or IHP assistance. About 5 minutes and 10 seconds reading time for this 1.4K word page. Our experience tells us to identify 2 factors before applying to FEMA for any type of grant award. You MUST apply to FEMA if you plan on asking or using any federal assistance or non profit groups. Applying to be issued an FEMA Disaster Account ID. Background: Our experience might not match your 100% but it doesn't have to match. We are only sharing our 20/20 hindsight with you so you can make a better recovery plan that ours. It's also important that you read our financial information, many of us lost 10's of thousands in contents, vehicles, clothing, furniture, etc. You need to know up front that their are NO GRANTS that you will qualify that allow you to purchase a Vehicle or clothes. FEMA will tell you that you may qualify for ONA (Other Needs Assistance) which includes Vehicles and Contents. If you have any type of measurable income this will never happen. We have even had people referred back from the SBA (which I will cover) to apply for ONA and FEMA has denied them. But the sales pitch you will hear is "If you don't apply for an SBA Disaster Loan you are not eligible for ONA Grants. Take it from victims that followed what FEMA told us to do and are now suffering 100 fold for thinking we would get $7, 000 or maybe $10,000 in Grants to help purchase a new vehicle since over 220,000 vehicles were damaged in the flood that effected 120,000 homeowners. We need for you to get all your finances in order and create a budget. We have a spreadsheet called "Living on Percentages" that can help you budget and create a true Income to Expense monthly report. Click here to download our "Living on Percentages" spreadsheet. Look up your NET combined household income using the previous years tax returns. This includes everyone that was living in your household under your roof over the age of 15 that had an income. Calculate your total household income then identify your AMI % using HUD AMI documents or the chart that is on this page for FY 2018. Examples are below 80% AMI chart. County, State, Number of persons in household, select the row with your county name then select the column with the total number of persons living in your house at the time of the disaster. Example: IRS Reported Income tax NET for year 2017 is $33,956 you have a family of 3 which includes all minors and you live in Onslow County you are at or below 80% AMI based on HUD calculations which allows you into the HUD CDBG-DR Grant program that will offer you several different ways of rebuilding, replacing or reconstruction to include elevating your home above the Base Flood Elevation Plus 2 feet. If you apply and then sign and accept the SBA Loan every dollar you borrow that has to be paid back will be counted against you for any future grant awards. So if you sign an SBA Loan for $25,000 and next year this month HUD CDBG-DR starts processing grants you will be penalized the $25,000 and it will be used as a Duplication of Benefits because it's a federally secured loan. If you need to borrow money, use private lenders, family, friends, any bank in the world but NEVER USE SBA if you are in the list above. Private loans are not counted against you when Grants are available to you next year. Read what a 35 year retired OCD director has to say about the SBA loans. She wouldn't allow her own daughter to apply for the SBA Disaster Loans because she knew that her daughter would qualify for HUD Grants the following year. Example: Here in Louisiana HUD pays $45,000 to replace a single wide manufactured home and $65,000 for a double wide. If you borrow from the SBA $10,000 because you just can't wait that $10,000 will be deducted from your $45,000 grant award or your $65,000 grant award. 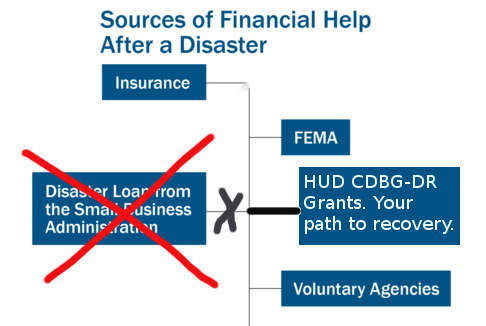 This is how the system that FEMA and the SBA created works. So learn it fast, it's this week you start seeing these offers and they will sound very nice. We were offered $120,000 from the SBA. That would have been counted against the $90,000 in grants we are receiving from the HUD CDBG-DR Grant program. That would have canceled out or disqualified us for any grant money and we would be paying for 30 years the new loan of $120,000. If we would have waited, between what FEMA gave for IHP ($30,000) which you do not want to spend until you actually start your rebuilding or reconstruction. But we would have had our $120,000 in total Grants which would not have to be paid back if we did everything on this page as it is written. Do your research on me, this site and our group members listed below. We are the ones that can help you save 10's of thousands without given us your name or address. We want nothing in return from you. We want your recovery after the disaster to be better than ours was and the next declared disaster we'll send them notice and include issues you all report to us as well. Eventually we will have a disaster recovery process for the victims by the victims of disasters that doesn't have some special interests in the weather other than if it's sunny or not. Do I have to apply for a SBA loan in order to be eligible for other Federal assistance?